One of the things I enjoy the most about exploring a new city is to walk around dinner time and pick a spot that seems to be popular with the locals. I eschew any sort of guide or recommendation for this and just go with my gut. Sometimes it leads to disappointment but usually it turns out to be a great meal. Last night’s dinner at El Bonpland was decidedly the latter. My original plan was to go to a recommended sushi spot called Osaka, which was fairly close to my loft. However, when I got there, I found out it was closed for repairs until February. I had been looking forward to getting something non-meat related for a change so that was a bummer. Nevertheless, it looked like there were several other options near by so I started scoping them out. I had actually walked by El Bonpland on the way to Osaka and had made a mental note to go back there at a later date. It looked cozy and very much a locals restaurant. It was still pretty muggy out so I hoped to get a table inside but everything was either taken or reserved. I took this as a good sign though and agreed to a table outside. The menu was pretty extensive, filled with various meat options of course, but I decided to stick to my no meat plan. Fortunately, there were several dishes that fit the bill. I was immediately drawn to the tortilla espanola – a long time favorite of mine since my days in Spain – and was very curious to see what the Argentine version would be. Since I wasn’t sure about the portion size, I also ordered the arroz Bonpland, which was melted cheese, pumpkin, mushrooms and grilled onions. There was only one waiter for the entire outside area and he was overwhelmed. 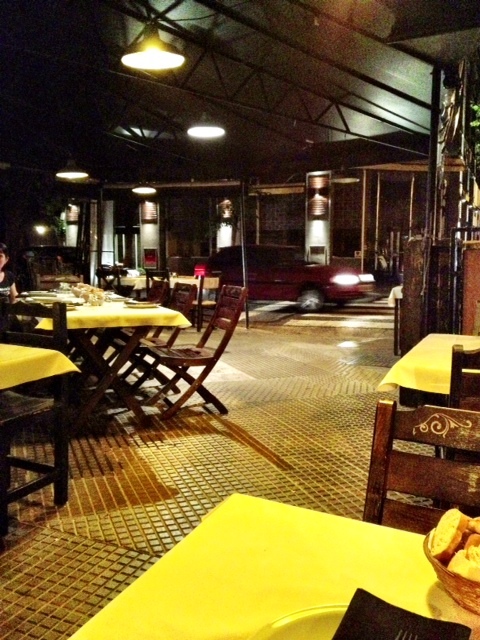 That led to some delays getting my food but I had long since given up ever getting anything quickly in Buenos Aires. This didn’t bother me though as they had a decent WiFi signal as well as being situated on a great corner for people watching. Looking around, I was clearly the only gringo there, with a lot of couples and groups of friends just enjoying their Tuesday evening out. When the food arrived (no pic alas as the lighting was off and didn’t quite look like it should have), I was floored to see an authentic tortilla espanola like I had all the time in Spain. It tasted just like it too and brought back a flood of memories. The rice dish was also delicious. The portion size was a wee bit more than expected so I took the rest to go. Another great spot that I will probably return to before I leave. Posted on January 9, 2013 by reyalto. Bookmark the permalink.